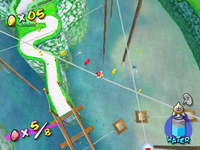 The Red Coins of the Lake is the eighth episode of Bianco Hills in Super Mario Sunshine. The episode's objective is to collect the eight Red Coins on the course's lake. Above the water in a collection of regular Coins. The player can use a lily pad or a Skeeter to reach it. Above one of the ropes that leads to The Hillside Cave Secret area. Above the rope at the end of the path through the gate from the village. The player has to use this rope to launch themselves to the platform with the Rocket Nozzle. The remaining five Red Coins are all above the various ropes. The player has to jump on the ropes and/or use the Rocket Nozzle to reach those that are too high for Mario to reach normally. This page was last edited on November 7, 2017, at 16:00.